Narcotics Detectives Arrest 3, LIVINGSTON, June 23, 2012 - A lunch time vehicle search rendered methamphetamine and 3 arrests. 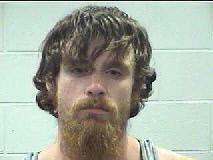 The search occurred when narcotics detectives with the Polk County Sheriff's Office stopped a suspect vehicle in the Subway Sandwich parking lot. The vehicle was occupied 4 people (three adults and a minor). Detectives Andy Lowrie, Howard Smith, and Deputy Mike Nettles searched the white Chevy Cavalier. 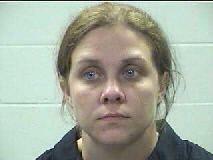 The search turned up an undisclosed amount of methamphetamine. Two of the adults, Krystin Michelle Burchers, 26, of Livingston, and Jimmy Ray Ross, 26, of Onalaska were charged with possession of a controlled substance. 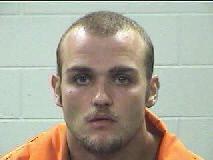 The third adult, Drew Alan Dunn, 27, of Livingston, was charged with passenger not secured by seat belt (the minor). Krystin Burchers, Jimmy Ross, and Drew Dunn were all driven to Polk County Jail and booked in (the female minor was taken into protective custody). A rollback wrecker from Ken's Towing recovered the vehicle. Deputy Mike Nettles puts cuffs on 27 year old Drew Alan Dunn of Livingston. The suspect vehicle was recovered by Ken's Towing.